Here I sit on the floor of Elijah’s nursery writing this email with a heavy heart. Today April 30 Elijah Thomas passed away while we held our son in our arms.The song “Son of God” played in the back ground over and over again. (If you are not familiar with this song you can go to Rivchurch.com and look under the music link and there you can hear Dan Price singing with Kristen Cambern singing out to God from one of our services) The Lyrics speak for themselves I would love if you please listen, writing these lyrics right now may be to hard for me to do. This song just played over and over while our son took his final breath from his exhausted little body and went to his heavenly father for comfort and love that we could not provide him. 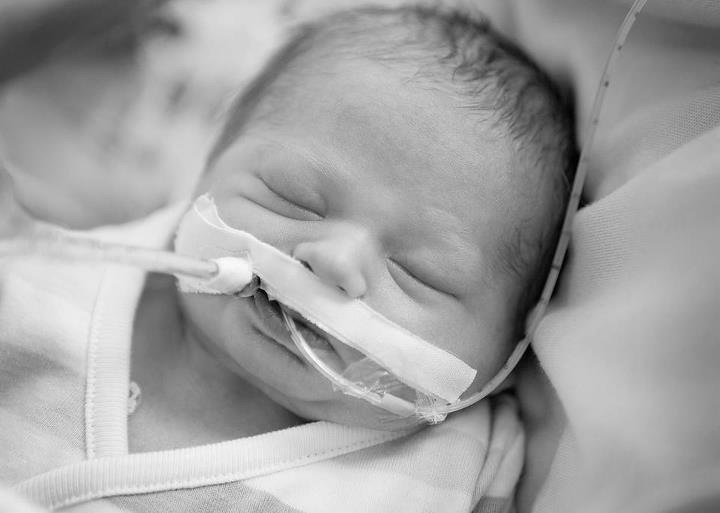 I felt a calm rush over me as Ron sits holding the head of our son and he looks into our eyes one last time.We are alone with our boy as he passes no more nurses , or doctors, or machines just Elijah’s three parents Ron, myself and God. After a few minutes Dr Jason Christensen steps in and unwraps the blanket he listens no more broken little heart beating. I hold him, I can’t let go, I sit rocking my baby boy. After a while Jen our amazing nurse steps in and asks if she can finish unhooking Elijah from the machines that had been sustaining Eli’s life. I hand her our baby and go to the grieving room where our parents, Chris and Wendy sit listening to Dan Price a Pastor from our church read bible verses to them. To take a step back. Before Eli is taken off his ECMO support everyone got to see Elijah unhooked form his ventilator and see his beautiful face while Dan prayed over us and read scripture as well. The song “Let Go” by Matt Hammitt plays over and over.We ask our family to leave so we can share our final moments, with Eli. We again tell him our love, of how proud we are of what he has accomplished on his 12 days on earth, how strong he was, and how it is ok to go be with God. We pass our son from one parent to another into Gods hands. We then go to sit with a room full of my loved ones, I tell them how E passed on to God and Dan reads more scripture, I am thankful for this. I tell everyone about what Elijah was brought to earth to do because I want no one to forget what an amazing job he did at this. He brought people together in love, and prayer. He has more than 20,000 followers of his blog, these people read and post, people from all over the world 20 different countries follow this little baby boy on his journey to go live with our Heavenly father. We have posts from every nomination church praying for Eli at service, or in life groups, prayer chains, etc. He was amazing even through death he is our miracle, people were brought together with love and compassion. Lets never forget this so Elijah will live on. We talk about Funeral arrangements and what has to be done and I am at a loss of words or thought. Jen steps in and tells us Elijah’s body is ready to be held. Grandparents hold the body of Elijah but his spirit is living in our hearts. Everyone cries, I have changed the music in the room to “Little Light” by Matt Hammitt. Everyone is done holding him. I get Elijah back in my arms and hold him swaying to the music “Beloved” by Kari Jobe. I hold him, and hold him, I can’t let go. Jenn steps in and I am sobbing over her taking our baby from me. She gives me more time. It’s just Ron and I, I sway, I rock, I kiss my boy all over his body, I can’t hand him over. Ron talks to me, he finally says I will take Elijah and hand him to Jen. I sob, I can’t breath, Ron takes him and kisses him and hands Eli’s body to Jen. He is wrapped in his blanket, I run I kiss his little head and we leave. I can no longer write for today I will fill everyone in on Elijah’s funeral and other thoughts later. I leave you all with Thanks. So the story I told last night happened again, minus the tongue. When I woke up to pump at 3:00am I called to check on Eli. Tiffany said he was doing well they were pulling 15 cc’s of fluid (3 teaspoons and hour) things looked good….1 step forward. However the Dialysis machine was beginning to clot again, they were going to try to get to 7:00am and then replace the machine,( this means the conflicting Medicine that is hard on Elijah’s heart) but at 7:00am the change had to happen…. 2 steps back. I couldn’t believe this, it had only been 12 hours this time. Again I prayed from 3am until 6am when Ron and I came back to the hospital to be with E. I prayed “Jesus I trust you, is this what has to happen, please comfort Elijah, we are at your mercy, I love you and thank you for all that you have given me, I’m not afraid, I trust you, please do what is best for my son, I love you, I love him, is he going to get better, please don’t let this brave little fighter suffer, he will fight it is how he was made, let him know it’s ok to stop, only you know, you are in control, I trust.” Prayer like this happened for three hours. We got here and he did it again without even waking up this time. All I can say is this little boy just wont stop!!! His heart rate stayed good, he responded instantly to the blood pressure medicine. Each time we have switched the machine he has done it easier, or we have all gotten better about how to take care of Eli and what he likes, and can withstand.One of the doctors even commented on how on top of everything I am. Knowing his medicine, the rates he gets it, the order we did it yesterday, how he responds, she said I was on top of everything. I wonder how is Elijah doing this? I am in awe! I want him to be at peace with whatever is good for him. He truly is a brave little soul, he is a braver soul than me! 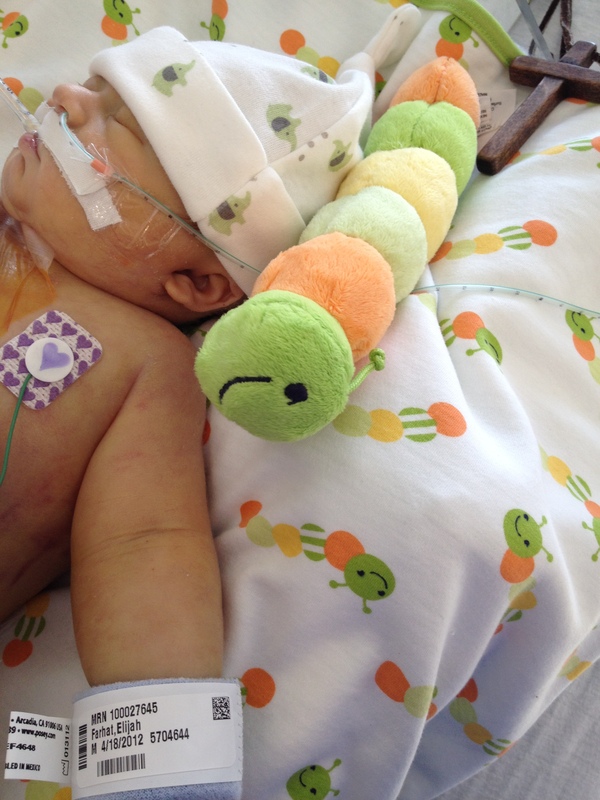 Elijah with his comfy caterpillar, and new bracelet (it finally says his name). So after I posted this morning Eli gave us another scare. Well I shouldn’t blame E for this one but either way it was frightening. Elijah’s Dialysis machine had to have a filter change meaning it was catching clots from Elijah. So to do this they have to give E a medication that makes him drop his blood pressure to extreme lows, and then counter act this with other medicines. This was all done after E had to be shocked this morning. Dr Christensen is here with us again and told Ron and I that E might not make it through this. His heart is just to week. We had an hour with Elijah before this change over happened. My parents had just walked in so to come into this situation was scary and they were sent right out to the waiting room. Ron and I both held one of Elijah’s hand, I rubbed his tiny hand and he was wide awake looking at us. What is he thinking? Does he know? Is he scared? Both Ron and I laid our heads next to him and told him (without even knowing what the other parent said at the time) Eli if you can’t do it we understand, we love you and understand if you can’t fight anymore, if your to tired we know, we are so proud of you, we love you, it’s ok to let go. They started the change Ron held his hand I rubbed his head. I lay my head next to Elijah’s. I close my eyes and I pray “This is your will not mine I trust you to do what Eli needs” over and over and over. The song “Trust” by Matt Hammitt is on replay in the back ground. Eli turns bright red they push meds, 20 minutes later it’s over. Elijah did it, not only did he do it, but he did it easier than he had done yesterday. Too top it off he stayed awake the whole time and had his eyes open and when Dr Christensen came to say he did it, Eli made it through Elijah stuck his tongue out right on cue. We all laughed it was AWESOME!!!!! I wish I could give you more information but we don’t have a lot. Elijah is very stubborn, and knows what he likes and what he will tolerate or not. He teaches us lessons everyday about not being pushed to hard or he will retaliate. With this being said we have let him lead us both yesterday and today. 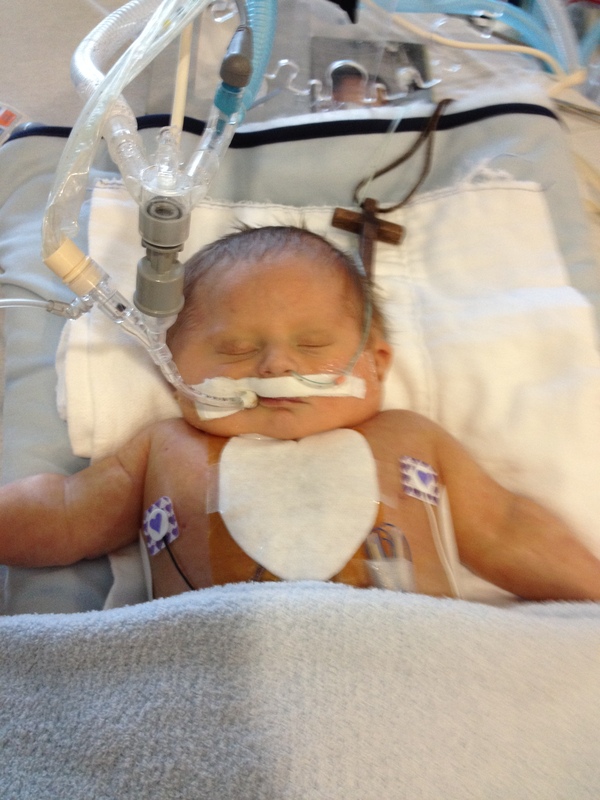 He proved to us early yesterday that he was not going to let us pull extra fluid from his body, he likes it. So the doctors and nurses let him keep what he had but did not let him add anymore yesterday. Before bed last night the staff started puling just 5cc’s off of him over an hour at a time (this is equivalent to 1 teaspoon an hour). they did this until about 3 am then Tiff upped his out take to 10cc’s an hour (2 teaspoons) and we are going to stay here for today, Eli is accepting this change. 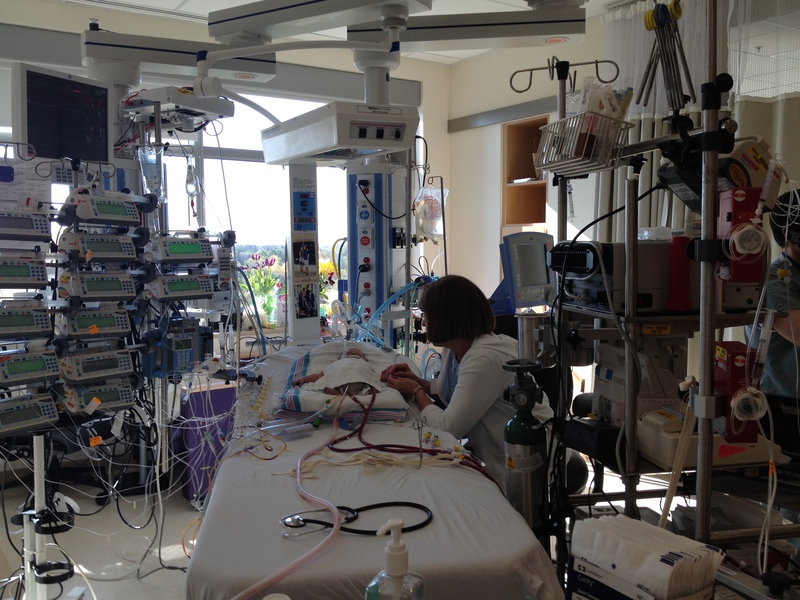 He is using his heart on his own even on Ecmo but just enough to let us know he is still here. He has started to have a Arrhythmia, Because of this the staff decided this morning to shock his heart, to get it back to a set pace. Thank God it worked, they also added a new medicine to control the Arrhythmia. He is being weened off his blood pressure medicine, and handling this ok. Elijah has a very sick heart. Baby Elijah is still opening his eyes and moving, this is good. As his parents it brings us joy when he looks at us, but also it brings a heavy heart. How is it possible to feel so torn about things, it is sad to see your son wanting you and knowing you and yet I can’t help feeling like I can’t help him. When Ron talked to him this morning Elijah opened his eyes wide and looked right at him, how awesome. I let him know all the time I love him, and how proud I am, how he is so strong and amazing, he is beautiful and he is not just my son, but daddy’s and Gods. I tell him how he is bringing people to him everyday, and about how much he is loved and how everyone is praying across the world. Lexi goes to Catholic school and her entire school prayed together for E this week, I have Dan and Holly from our church Riverview putting the prayer chain in order, we have St Thomas that prayed last week at all their services, we have our friends, and family sending out Eli’s story to everyone, Tom Izzo called me personally and we have Michigan State Basketball team thinking and praying for Eli (thanks Alex), People from Canada, United Kingdom, Jordan, Arab, Australia, Singapore, etc reading about Elijah. We have 15000 hits on the website yesterday and over 5000 followers. This is the one thing I know, God is using Elijah for, to connect us with love and compassion. To bring us closer together and to him. Today make sure everyone hugs their family tighter and lets them know how much you love them and how grateful you are for your life with it’s little hiccups. My friend Mary Jo commented on an old picture of my beautiful children from a family trip to Grand Haven and it made me realize even through everything we have been going through how grateful and blessed I am. I love all of my children so much and this message is for them. Carter, Lexi, Paige, Ryan and Elijah when I look at you I see good, I see hope, I see beauty, I see God. I love you Mom. This is the picture Mary Jo had me look at this morning. Eli this morning, Tiff made a heart patch for daddy. Thank you Tiff!!! She also gave him back his blankie. So if you haven’t heard here is the update. At 10:20 last night Elijah’s heart stopped beating. Even though he was struggling to stabilize, this was still a complete shock to everyone involved. About 20 minutes before this event Elijah had a Eco cardiogram which indicated good heart function, so no one could understand where the stopping of his heart came from. We had a team of about 15 doctors and nurses at bedside already so the staff started chest compressions immediately so the ECMO team could get here and get him hooked up. This is where we sit this morning we are waiting on information on Elijah’s head ultrasound, anytime a baby has to have chest compressions there is risk involved. Next we are starting Dialysis to get the extra toxic fluid off Elijah. Lastly we let Elijah rest and not put his little body under any stress. Elijah is moving all his limbs he is opening his eyes a lot and makes eye contact. He loves when I kiss his head and sing to him he even smiled a little after I sang one of his favorite songs “The Redeemer” by Sanctus Real. The staff is cautiously optimistic about all his movement today.I know my job today is to be Elijah’s momma and try to comfort him, tell him how amazing he is and how much he is loved not only by me but by everyone who is following him, praying, and loving. I know your heart is breaking for all of us and we appreciate this more than words. I would love everyone to go back and read the brave little soul blog again. One day maybe I can write in greater detail about what last night was like for all of us but know every single person here said it was an awful night. For Ron and myself it was truly the worst day of our entire lives. If you know Ron know well you will know he already lost one newborn at a few hours old, but at least Madison went relatively peaceful. We have told Eli that if he is too tired we understand and I have changed my prayers to God to make sure he knows I trust in him and his plan for all of our lives. I may not understand why, but trust God to lead us all and teach us in this part of our lives. I know I never thought I could be so strong and can only attribute this to God working in me, and I know he is still working in Ron and Elijah also. I know you are waiting to hear, Elijah is really struggling to maintain his stats. The doctors and nurses are doing everything they can to stabilize him but he just keeps slipping. Again no on has stopped moving since he came to the unit, he wont let them. They have called the surgeons back in and are talking about opening Elijah back up. They are worried he may be swelling and collecting with fluid cause pressure to build up without release. I am feeling week and feel like I can do nothing but pray and tell Elijah how much I love him . I tell him what a strong boy he is and that if he can’t fight anymore I understand. I tell God the same thing to listen to Elijah and his soul and know when my brave little man can fight and when it’s time to stop. I love him, I love him, I’m so scared, just tell me what’s going to happen, I’m so scared. The nurse just made a comment that as long as Elijah has Everyone’s full attention he behaves, so now that all the doctors are here, he has been ok for a little while. More waiting…Allison is here rubbing my back and telling me I am doing a great job, and it’s ok to ot know what to say and how to feel except I do know I feel like my heart is slowing breaking. I would like to start by telling the story of Elijah the prophet raising the dead. I read this all morning and prayed the same prayer. This is my shorted version. So our baby boy is done with surgery! The surgeon came and took Ronnie and I in a private room where he told us Elijah was done with surgery and has a new shunt put in, just as planned. However from Elijah being a preemie and all the trauma E has been through in 8 short days that he is having a few issues with bleeding. Because of his fragile body tissue and the amount of blood Elijah was losing they ended up having to put Eli on the bypass machine. We were hoping they wouldn’t have to use this, but knew it might have to be an option, unfortunately it was. The good part of this is they did not have to stop Eli’s heart and they were able to keep his body warm for the the bypass machine. The scary part of this is Eli still had to have his blood thinned and for Eli this could effect his prior brain bleed, this is something we will not find out about until the doctors perform another head ultrasound, in the coming days. Dr Bove also stated that Eli’s Pulmonary Artery looked relatively normal in size to him and decided it would be Ok until Eli’s 2nd surgery (between 3-6 months of age). Also while looking at the sinusoid he could not tie this off because he just couldn’t tell how the sinusoid was feeding the coronary arteries, so again we are leaving these until the 2nd surgery too. Eli’s heart did great coming on and off of bypass and it never even skipped a beat. 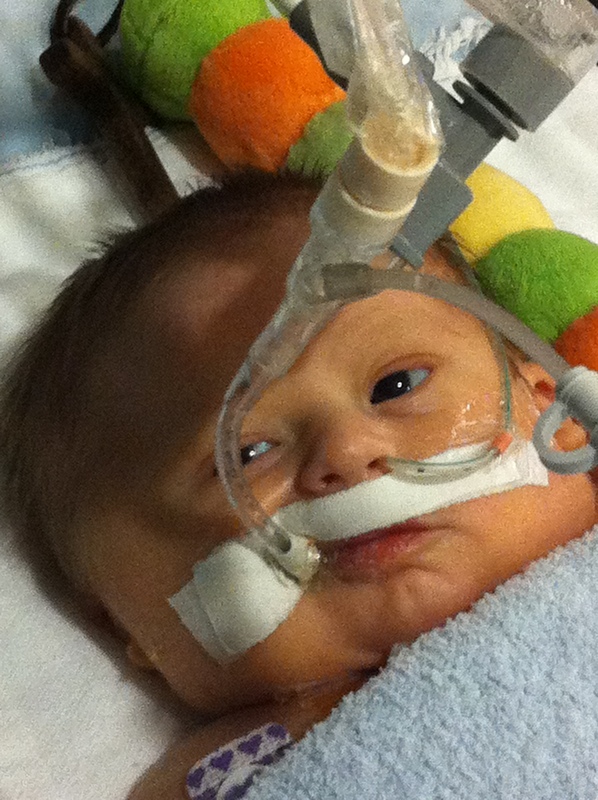 Elijah also had 2 small drains but in his body to help protect his Kidneys. They can use the drains for dialysis if needed or just as an option for drainage. The doctor said Eli was still filled with a lot of bloody liquid when they opened his chest and as soon as the fluid came off he saw an immediate improvement in Eli’s stats. So we are happy they took this step to help protect Eli! Eli is still in the operating room and they were waiting to close him until they had his bleeding under control. We are waiting to hear when he is moved to the Bull Pin again. Ronnie and I will be the only ones allowed to see Elijah today but we will keep everyone informed on his progress, to pass along updates. If everyone right now who reads this can say a prayer that Eli will stop bleeding so they can close his body, this would mean a great deal to us. Also for the next 48 hours Eli will be very unstable so please don’t stop praying for our little miracle, God is hearing us cry out and he is listening! I don’t have the energy to proof read this because of the emotion it brings so understand.